High performance geomechanical computation and simulations of seismic wave propagation in three-dimensional in-homogeneous anisotropic media, with account for fracture influences. 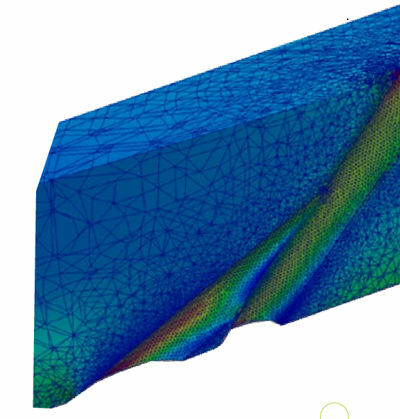 Geophys allows to effectively solve complex geomechanic and seismic modeling problems, accounting for fractures, non-linear processes, elastoplastic deformations of media, temperature deformations and complex geometry of resource reservoirs and boreholes. It provides functionality for the calculation of effective media properties based on both user defined media geometry and the tomographic imaging of samples. Up to 5 times more accurate calculations as a result of an advanced implementation of borehole and surface seismic events numerical modeling based on a modified method of finite elements. The underlying calculations engine uses the explicit algorithm with spectral convergence and a user-selectable approximation order of accuracy in space. To solve active and passive seismic problems a complex mechanical input is used, which is composed from three-dimensional anisotropic elasticity equations with account for thermoelastic effects and induced anisotropy caused by the inhomogeneous field of the initial geomechanic deformations. Modeling of nonlinear processes occurring in rock formations, with account for elastoplastic deformations of the media, the apposition of layers at the boundaries of tectonic rifts and thermal strains. Geomechanical research of stress distribution in seams in the vicinity of resource reservoirs and drillholes, including curved and branching holes. Optional account for fracturing, array media anisotropy and non-linear effects in the mine’s bottom zone within computations. The Fidesys engineering company was founded in 2009 by experts and graduates of Lomonosov Moscow State University, Department of Mechanics and Mathematics. The Fidesys team includes 35 graduates of Lomonosov Moscow State University, Bauman Moscow State Technical University, Moscow Institute of Physics and Technology, and leading regional universities. Led by 11 professor-consultants with strong scientific backgrounds and in-depth experience in solving complicated problems, the company’s focus is on engineering. Research of the effective properties of media (the creation of a virtual laboratory to assess the mechanical characteristics of the core and the digital analysis of cores based on tomographic imaging data). To evaluate the average elastic properties of porous and fractured material on a microscopic level the effective medium theory is applied. As part of the effective medium theory a digital model of the core is subjected to a series of virtual tests on compression and shear, in each of which stress fields are calculated and averaged by the core’s volume. On the basis of the obtained averaged stresses and the deformations set during testing the effective characteristics of the core are computed. 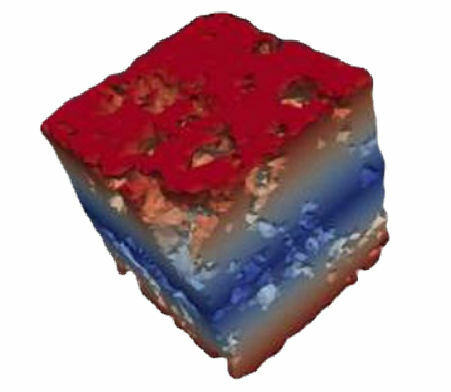 Calculations of the effective moduli of rock are produced by numerical methods using calculations based on a representative volume — this allows to estimate the effective properties of composites with arbitrary geometry. The suite also supports the ability to automatically generate the geometry of representative volumes (periodicity cells) of the main anisotropy types of rocks from user-defined geometric parameters. The application suite supports the ability to perform calculations based on the obtained effective property constants of orthotropic or isotropic materials with the export of the latter into XML and the possibility to import it back into Fidesys for use in further calculations. We are offering three functional modules – Fidesys Dynamics, Fidesys Composite and Fidesys HPC – which are designed for specific industrial needs. All of them can be installed on CAE Fidesys platform, and are included in the trial version, which can be downloaded here. The trial version gives access to the full functionality of CAE Fidesys Professional and all the functional modules for 30 days.